Ever wondered what those designs hanging up on the walls, in the binders, or even on the tablets at your local tattoo studio were called? These my friend, are what are known as tattoo flash designs. Sometimes they may be designs made by an artist from the studio, or from a local artist looking for some exposure. More often then not, these designs are usually the generic and readily available designs that can be found in most studios all across the world. In recent years, the flash system has since become a display of quickly done, and generic tattoo designs. This is a direct result of street-shops popping up, that were tailored towards the impulsive and walk in clientele. The designs that are commonly found in a studios flash display, are purposely designed with rapid tattooing in mind. With the designs being generic enough for the uninspired, or enough to function as a base for your own design. 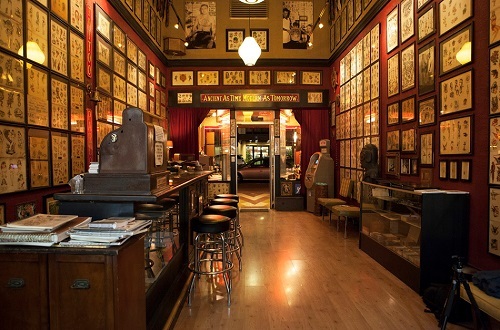 Originally, the collection of tattoo designs displayed in a flash system were unique to the studio. They would showcase the unique designs made by the artists themselves. The studios would either have a display for each artist individually or every artist being displayed collectively. Occasionally a local artist would also sell their hand drawn designs to a studio as well. With the development of technology, sharing tattoo designs has become so easy that design theft has skyrocketed. Where once an artist would proudly display their own designs for potential customers to peruse through. They now safeguard these designs to prevent anyone from stilling their work. Before the development of social media. People would simply sneak a photo with their phones, then shop around with other studios looking for the best price. This practice only got worse over the years as people would upload the designs they were thinking of getting to their social media accounts, and other “artist” would take these designs and claim them as their own. Artists that still have a flash system with their own designs, are more likely to keep them away from prying eyes. Only bringing them out to show potential clients during a face to face consultation. Rarely would an artist openly display their unique designs or leave them unattended these days. Designs that are commonly displayed in a studio, are the basic concepts of a design such as Tribal and Celtic patterns, or hearts and feathers. Or they are basic drawn images that are ready to go for rapid mass-production tattoos. Customers can pick their tattoos from these readily available designs or use it as the base for their tailored design or as inspiration for their own custom designed tattoo. Technology has also had an impact on the way tattoo designs are made. Where we once had to draw designs by hand using nothing more then pen and paper. We can now use drawing tablets to make the designs on a computer, as well as use imaging software to create our designs or even convert an image from a photo into a tattoo design. All these factors have resulted in unique designs being less likely to be found in a studios flash display. As tattoos are no longer viewed as a social taboo with their popularity on the rise. There are many artists that now design tattoos that are sold either online or at conventions. Some of these talented artist have never picked up a needle in their life and only create universal designs that are then used by the tattoo artists. There are companies similar to I-Stock and Shutterfly that specialize in selling tattoo designs from various artist. Many of the common designs found in local studios are sourced from these sights. Studios can also source designs through sights like deviantart and creative market. We too supply various tattoo designs to our members. For more details click here. Just because there are many flash designs out there for you to pick from. This does not mean that you have to use that design as it is. You can freely modify the design by adding or removing details, shades, volume and colors. Look for a design that appeals to you and speak with your artist about tailoring it to your own needs. The artist can either modify the design as much as you would like. Or they could use the design as a base for art style that you are after. The artist may even have some of their own designs already set aside. Custom designs are in vogue right now but the reality is that even custom designs draw inspiration from somewhere. You can still have your own unique tattoo that speaks to you or showcases what makes you who you are. The pictures below are examples of how one concept, in this case tribal designs, can be tailored into multiple variations that suit the art style or theme. Yet remain unique enough from one another that they can be viewed as having a truly unique appearance. No matter if you are looking to use a pre-made design, having a designed tailored for your needs, or having a completely customized tattoo designed for yourself. Just make sure to pick a design that truly speaks to you and avoid the “because it looked cool” mentality. Always remember to think before you ink.